A Washington mayor fought against the rail line that carries high-speed passenger trains from Tacoma to Olympia, and predicted that because of safety issues with the route, fatalities were inevitable. On Monday, Dec. 18, his prediction came true when an Amtrak passenger train jumped the rails in DuPont, killing at least three and leaving 10 critically wounded. Lakewood Mayor Don Anderson said he thought it was only a matter of time before someone was hurt, although likely for a different reason than what happened Monday. This catastrophic derailment is horrific. My thoughts are with those injured & our first responders who rushed to the scene. The City of Seattle has offered our assistance & is ready to work with Amtrak, local, state, federal officials in the aftermath of this tragic incident. He said he was worried about the number of at-grade rail crossings along the train’s route, and that because the high-speed passenger train was being put on a little-used freight line instead of a new one, a lot of safety features that he thought should be in place were grandfathered out. He said that if the line had been built from scratch, there likely would have been more tunnels and overpasses built to protect people at crossings. He also objected to the new line on monetary grounds, saying that for the number of people who use the high-speed passenger service, using taxpayer money for it was not justified. 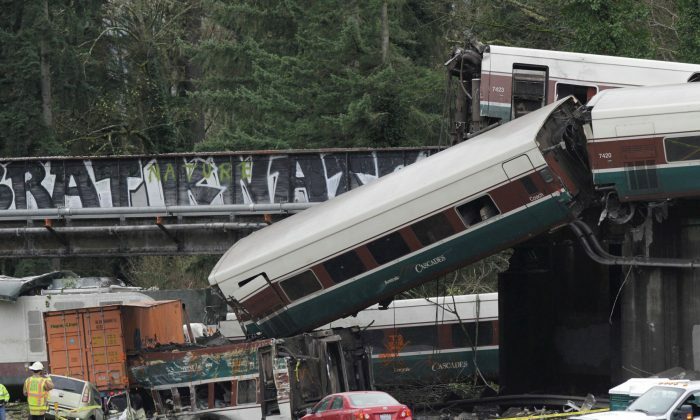 The derailed Amtrak train – traveling at more than 80 miles per hour in a 30-mile-per-hour zone – met its tragic fate off a highway overpass on the I-5 highway at about 7:30 a.m. The train fell onto highway traffic, hitting five cars and two semi trucks. There were 86 people on board, Amtrak reports, 10 of who were taken to the hospital in critical condition and another four with moderate injuries, according to the Washing State Patrol’s blog. The cause of the accident is still under investigation by the National Transportation Safety Board.